FAT in the liver is the new marker for obesity-related complications such as diabetes, heart diseases and strokes. People trying to reduce belly fat to avoid these diseases will have to rethink their lifestyle. The finding is good news for metabolic scientists who have hypothesized for long that liver fat is the most important metabolic disruptor of the body but there were few studies to substantiate it. "Increase in liver fat causes regulatory mechanisms to go haywire," said Anoop Misra, director of the department of diabetes and metabolic diseases at Fortis Hospital in Delhi. When the body's metabolism is disrupted there is an uncontrolled manufacture of sugar and cholesterol in the liver, resulting in diabetes and heart diseases. A concentration of more than 5 grammes of lipids per 100 grammes of wet weight of liver is considered abnormal, said Misra. One-fourth of the urban population in India has fatty liver. Researchers from the US, Greece and Italy, studied 42 obese people who were divided into two groups. One had the same amount of liver fat and different levels of belly fat; the other group had the same volume of belly fat while their liver fat levels varied. Using diagnostic techniques, blood insulin levels were measured. The study, published online in the Proceedings of National Academy of Sciences on August 24, found a greater risk of the diseases associated with liver fat, irrespective of the level of belly fat, in all the people. Does the new marker then call for a change in approach towards managing obesity? Yes, one should concentrate on reducing liver fat, said Elisa Fabbrini, research assistant professor at the Centre for Human Nutrition, Washington University's School of Medicine and one of the authors of the study. Weight loss is the best strategy to treat fatty liver. Doctors are trying out new treatment methods such as diet control, drugs and weight loss surgery. 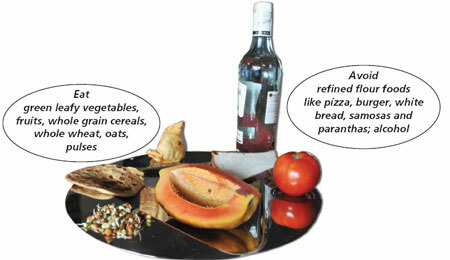 A non-diabetic must follow strict diet and maintain his weight in the nonobese range. Diabetics with fatty liver need aggressive treatment. For starters, one could cut down on the maida and the bhature. Misra has a ready list of eat and don't eat foods for those with fatty liver (see graphic). Even two days of calorie restriction reduces liver fat and improves insulin sensitivity, said Fabbrini. "Fatty liver disease is completely reversible. The approach is to cut the calories we eat." One must be careful though, as abrupt weight loss, more than 1.6 kg a week, may worsen the condition.